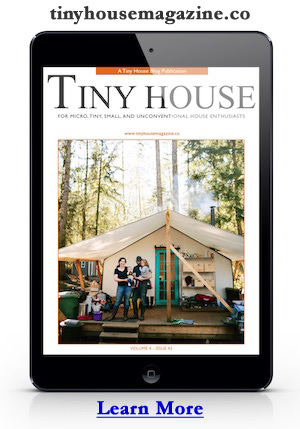 This morning I got an email from Ivan, another reader of tiny house design. He sent me a link to a new tiny house builder in Alabama. Kent McCaffrey, of Gratitude Millworks, is getting into the tiny house business and has completed the first of what should be a nice range of tiny houses. I really like the exaggerated roof on this tiny house, it’s a 12/12 pitch with short walls and full height gables on the sides. When you look at the interior (below) you’ll notice that the gables make the interior ceiling height mostly usable even though the knee walls (at the corners) are actually only 4′ 8″ high. What a great idea and make a functional interior. It’s almost like being in the second floor. The size also seems right, 180 square feet, with an interior dimension of 10′ by 18′. The roof footprint is 12′ by 24′ and extends over the 5′ by 11′ porch. I’m looking forward to seeing more from Gratitude Millworks. Thanks Ivan! This entry was posted in Builders and tagged alabama, Gratitude Millworks, Kent McCaffrey, tiny house. if one proposes to actually live in this alone, as opposed to simply using it as a “spare room” to an adjacent dwelling, i do not understand how typical clothes closets and kitchen wall cabinets can be accommodated, nor the hanging of pictures, clocks, calendars, etc. with the very limited wall space. In my opinion, there is plenty of space for all of the above. The idea is to live very simply. Beautiful, I wanted to buy the one on EBAY but can’t afford it right now. However, next year I will have him build one for me…..great detailed work. Excepcional Design,de um bom gosto ímpar.Parabéns! e Obrigado.